LaOS is a very impressive QBasic Open-Source GUI. 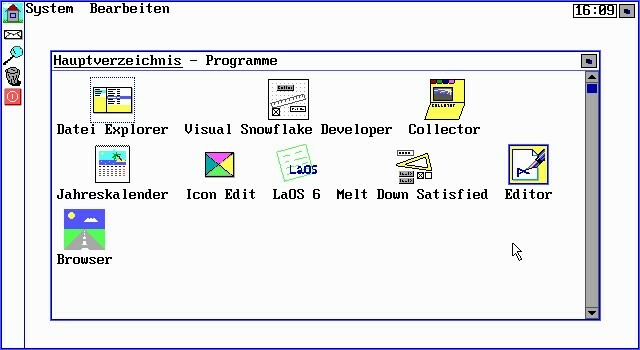 It is fully open-source, it has lots of neat programs including "Visual Snowflake Developer" based on the "Snowflake GUI" (more news at LaoSoft.ch). All of the programs are run in QuickBasic, and everything is in German. LaOS is by far one of the most interesting GUIs to ever be open-source. A SECRET: LaOS means "'La'ngmeier OS"
YES! any commercial usage is strictly prohibited. For commercial licensing regarding MP4 To MP3 Converter, please contact market[at]accmeware[dot]com.